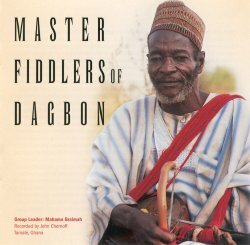 The new release from Rounder, Master Fiddlers of Dagbon, is a valuable addition to the world music catalogue. It is not only well produced, and will delight the casual world music listener, but also gives enough background information in the CD booklet to satisfy the musicologist. It is the first major commercial release of the fiddle music of the Dagomba people. The Dagomba people, properly called Dagbamba, but referred to in much of the literature as Dagomba (as I will refer to them here), inhabit Northern Ghana in an area they call Dagbon. The main town shown on the maps of Ghana is Tamale, and this is where the music was recorded. They are a very strong and proud people with a history extending back at least 700 years. Their culture has been preserved and passed down orally amongst the drummers, Lungsi, who are the griots of their people. The Dagomba migrated from northern Nigeria all the way to Mali, and slowly made their way down south through Burkina Faso, where their relatives the Mossi people stayed, and in to Ghana where some groups also split off to form the Nanumda and other related groupings. They set up their capital at Yendi where the Yaa Naa resides as the Paramount Chief of Dagbon. Originally the Dagomba had no instruments, only singing, but during the time of Naa Nyagsi the first drummer apprenticed the Lunga, commonly called the talking drum, or hourglass drum, and brought drumming to Dagbon. Later they absorbed the Gungon, a large bass drum, from the Kotokoli people, who live in present day Northern Togo, and thus the present day ensemble of Dagomba drumming was formed. Rounder Records has released two excellent CDs of Dagomba drumming: The Master Drummers of Dagbon Vol 1 & 2. The important thing to grasp from this incorporation of instruments is that although many tribes play these drums, the Dagomba have evolved their own styles of playing them which are unique. More recently, compared to the talking drum, the Goonji (pronounced gon-jay) was similarly introduced into Dagbon. It arrived in the early 1800s from the Guruma people of Burkina Faso. The Guruma people have always been closely connected with the Dagomba, and indeed a Guruma elder has a place in the circle of elders around the Yaa Naa. Interestingly enough, the drummers and goonji players have different stories of when and where the goonji was introduced, with the drummers claiming they know history more than the goonji players, a claim which may very well be true. For Dagbon is traditionally a caste society, with people born in to hereditary occupations like drumming, blacksmithing, butchering, and soothsaying. The drummers have always been connected with the chieftaincy because the first drummer was from the Yaa Naa's family. All of the drummers today can trace their lineage from this family, and have always been in charge of preserving the history. In what they believe is a mystical ability, a drummer can recount not only the entire history of the tribe, but amazingly the entire lineage of every family. This is remarkable when you consider a chief could have 30 or more children and those children have their own children and so on. The goonji players, however, have never had this task, and their music is more social than historical. As such, Goonji players often sing in Hausa, which has become a lingua franca for Muslims living in Ghana. In a town like Tamale you can find areas with many different peoples - Mamprusi, Gonje, Mossi, Sissala, Yoruba, as well as many other tribes, and Hausa has become the medium of conversation rather than Dagbali (Dagbani), the language of the Dagomba. Thus, while the drummers have always been attached to the chief and through him to the Dagomba people, the goonji players play for members of other tribes and thus sing in Hausa as well as Dagbani. This has given the Goonji players a more widespread appeal, and they have become quite popular in recent times. The Goonji is a one-stringed fiddle with a calabash resonator covered with skin. It is bowed with a curved bow, strung with horsehair, or in some cases the artificial hair used in weaving women's hairstyles. It is played by many tribes throughout West Africa with similar playing styles, the only variation usually being the construction of the instrument. It is played in an ensemble of two or more goonji along with accompaniment from Zaabia, which are rattles made from a gourd with the seeds sealed inside rather than strung outside. The musicians can be called to play at funerals, festivals, weddings, outdoorings of babies, or any occasion for celebration. The rhythms are all based on a 1-2 feel allowing anyone to dance comfortably to the music, and the Hausa lyrics ensure its widespread acceptance. Compared to the dance drumming, which has many changes and beats, the goonji music is much more accessible to the non-Dagomba listener. The music itself is formed around praise names of chiefs. The fiddles will play one part on the praise name over and over while the singer will improvise, and the lead goonji player will play variations off the main phrase. The music was produced and recorded by John Chernoff, a long time authority on Dagomba as well as other styles of African Music. Indeed his book African Music and African Sensibility (1979) is often used as a textbook for African Music classes. He has always shown the highest levels of scholarship in anything he produces. To this day people talk about him in Tamale, where he lived and studied in the 1970's, and praise his command of the language and music. He also produced the Master Drummers of Dagbon CDs for Rounder Records. He always gives well-researched historical and cultural backgrounds for the music, as well as relevant transcriptions of the music. He chooses to record the music outside rather than in a studio to give it the feel of a live performance. The music on this CD is excellently recorded and gives a very authentic sound. In short, it is a valuable addition to the catalogue of Dagomba music, and will likely cause even the casual listener to spontaneously begin to dance.